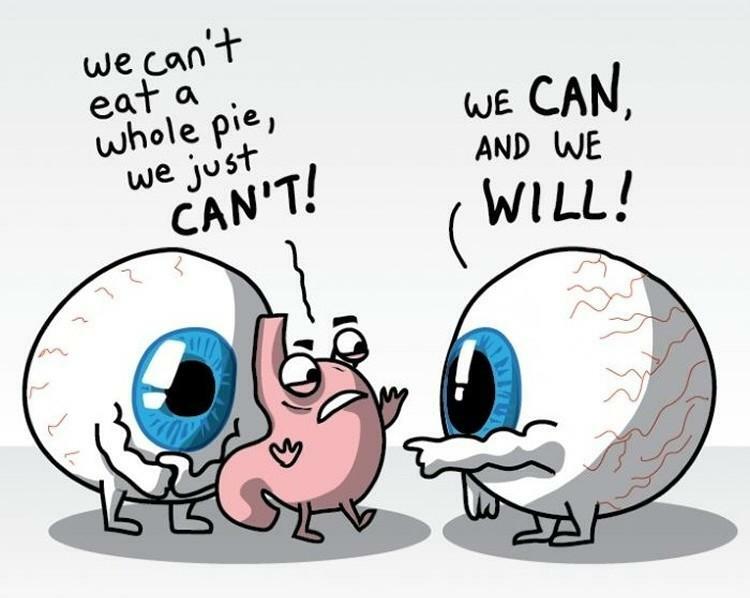 Well, it’s that time of year – again. Where retailers rejoice, children deploy their pester power to its fullest capacity, our homes turn into pulsating light displays reminiscent of aurora borealis, and where our eyes are most definitely bigger than our stomachs. Yes, Christmas time is full of traditions, customs and family practices – old, new, religious and non-religious. One of those rituals is the seemingly compulsory assembly of a Christmas tree – a modern symbol of friends, family, togetherness in general, and of course presents! But, did you know that the Christmas tree custom actually originated from Germany in the sixteenth century and was introduced to North America in the eighteenth century? Well, now you do (no need to thank us, just pay it forward)! 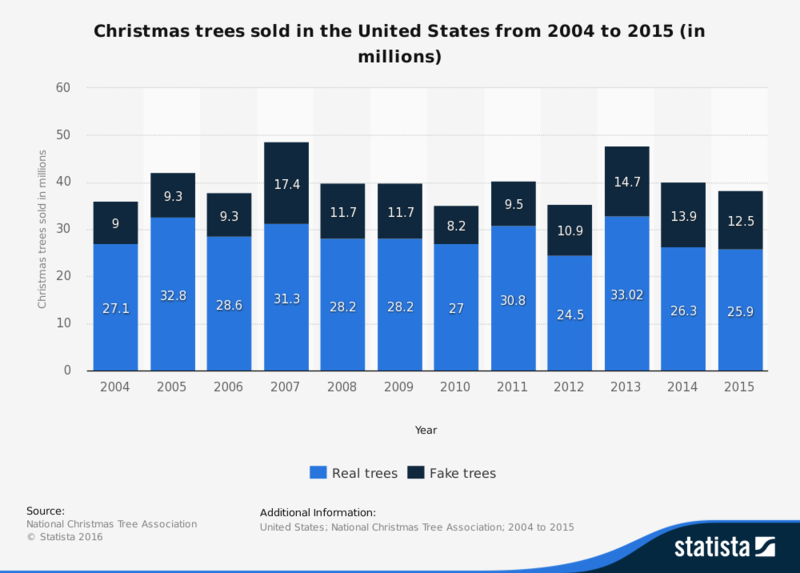 Using Business Intelligence and data visualization, we can assess the number of Christmas trees purchased in the US from 2004 to 2013, courtesy of data collected by www.statista.com (the world’s largest statistics portal, providing access to data from over 18,000 sources). While Christmas tree sales were yet to reach the pre Global Financial Crisis heights of 2007 (48.7 million) in 2013 (47.72 million), it seems like 2014 may set a new record – if last years jump is an indicator of renewed Christmas tree related enthusiasm. These figures, provided by the National Christmas Tree Association (NCTA) – yes, apparently it’s a real thing – suggest that Americans prefer to place their presents under non-plastic trees. From 2004 to 2013, real Christmas trees accounted for between just under half to just over two-thirds of total Christmas tree sales. So what’s driving this pattern; this penchant for ‘real’ Christmas trees? Well, interestingly, it’s probably not a desire for authenticity, but consumers’ hip pockets that are driving this trend. According to the festive folk at the NCTA, the average sale price of a ‘real’ Christmas tree is USD $35. By comparison, their ‘fake’ equivalents come with a price tag almost twice the size. Intriguingly, the average sale price of real trees has remained fairly consistent, experiencing limited fluctuation between 2010 and 2013. 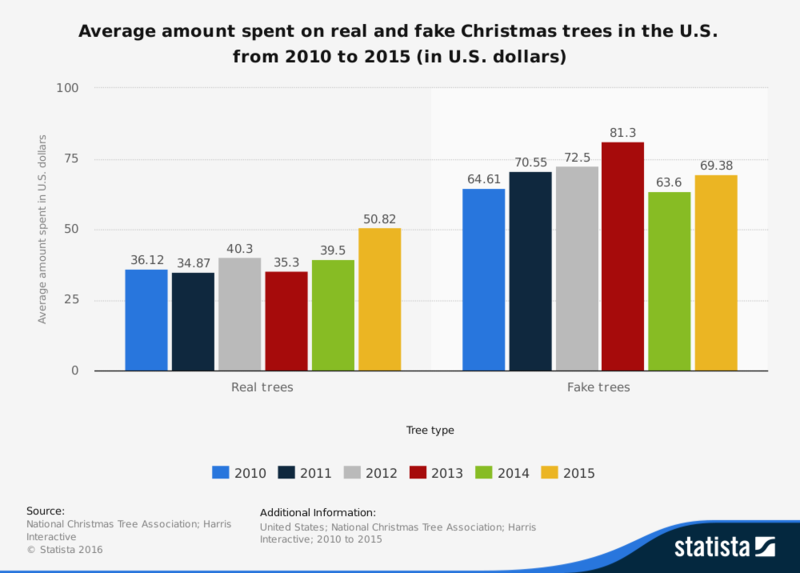 Conversely, fake trees have consistently grown in price, from an average of USD $64.61 in 2010, to USD $81.30 in 2013. Is this a case of retailers understanding their target audiences? That is, do those of us who spend extra on fake Christmas trees have bigger budgets to burn, and can therefore stomach incremental price increases? Or, is it just the inverse: That retailers understand most of us have a reluctance to outlay too much hard-earned coin on Christmas trees, and so keep the ‘cheap’ real tree option at a dependably accessible price-point? Perhaps it’s both. Whatever the case, the Christmas tree industry is undoubtedly big business in the US. 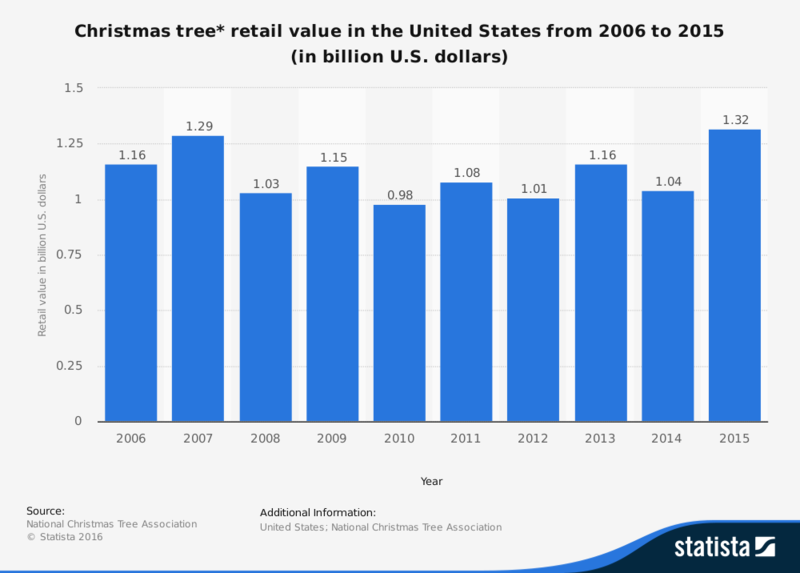 The total annual value of Christmas tree purchases has only dipped below USD $1 billion once since 2006 (USD $980 million in 2010). As stated at the beginning of this piece, to many people, the contemporary Christmas tree is a modern symbol of friends, family and togetherness in general – regardless of religious beliefs or context and commercial agendas. Australian singer, songwriter and comedian, Tim Minchin, captures this sentiment superbly in his quirky tribute to the Silly Season, White Wine in the Sun, when he muses “I really like Christmas, it’s sentimental I know, but I just really like it…”. And while some of the edgier notions in the song aren’t necessarily reflective of our own views, we reckon this alternative contemporary take on a Christmas song encapsulates what December 25th should be about – regardless of religious beliefs or consumerization. So what’s our point? Well, in the words of legendary crooner Frank Sinatra, make sure you do Christmas your way. Embrace the customs and routines that make December 25th significant to you and the important people in your life.